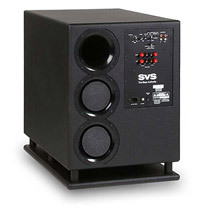 They don’t call themselves the the Bass Authorities for nothing, the SVS PB2-Plus subwoofer measures in at a huge 18″ wide, 25″ tall and 28″ deep. How heavy is this sub? A hefty 120 pounds… imagine how much air this thing can move in your home theater. You’d expect to pay over $4k for a subwoofer like this, but SVS has done it for a little under $1200. It’s proudly made in the U.S.A. and its twin 12″ custom TC-Sounds high capacity woofers are powered by an all digital 900 watt BASH switching amp. These guys really know bass… selectable 16Hz, 20Hz or 25Hz tuning with included port plugs, makes this sub a perfect match to any home theater speaker system.